On Grid « Global Market Insights, Inc.
With a great deal of interest to improve the quality of solar power system due to fossil fuels rigorously getting drained, thin film solar cells market is speedily evolving with every passing year. Strong concerns regarding global environmental issues has brought a dramatic growth in the clean energy market, with solar energy at the pinnacle. Furthermore, the surging demand for electricity specially from off grid areas along with reducing renewable energy tariff subjected to the increase in competitive bidding will heighten the market demand in the coming timeframe. As per a report by Global Market Insights, Inc., “Global thin film solar cells market is expected to increase its revenue fourfold by surpassing USD 30 billion by 2024, having had a worth of USD 8 billion in 2015.”Technological progressions along with a large number of promising energy conservation programs that have been initiated worldwide have resulted in a decline in overall component cost. These adopted initiations will act as a catalyzer for the overall growth of the market. In this regard, India is already a step ahead. In 2016, the country has launched a target of deploying 20 GW grid connected solar power projects in half a decade, which will finally result in cost reduction of solar power generation of the country. The solar technology is witnessing a continuous evolution with technological progression. Three types of thin film cells that are predominant in the market are cadmium telluride thin film cells, amorphous silicon cells, and copper indium gallium diselenide (CIGD)solar cells. Amorphous silicon thin film solar cells market accounted for more than 13% of the total volume in 2015, and is expected to observe a surge due to increasing demand for solar wristwatches, garden lights, and electronic calculators. Cadmium telluride solar cells are largely adopted for generating terrestrial solar power in residential sector owing to the product’s cost effectiveness and high-level conversion efficiency. This second-generation thin film solar cells industry is estimated to grow stupendously at a CAGR of 17% over the period of 2016-2024. Copper indium gallium diselenide based film solar cells are the top performing cells till date, with an upper hand due to absorption of more sunlight than the other products. CIGD thin film solar cells market is anticipated to generate a revenue of USD 8 billion by 2024. Low toxicity, high efficiency, and comparatively affordable manufacturing cost are the leading factors driving thin film solar cells industry to penetrate a wide array of sectors. 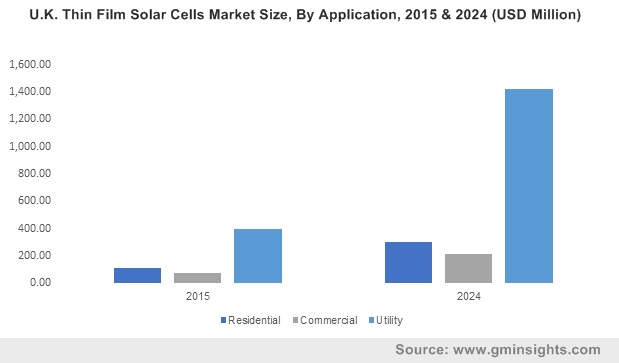 Thin film solar cells market is gaining a huge popularity across residential, utility and commercial sectors owing to its flexibility and light weight. Thin film solar cells industry from commercial application have collected a huge revenue of USD 1 billion in 2015, and is anticipated to be one of the prominent sectors driving the application landscape in the coming timeframe. Growing consumer claim for uninterrupted power supply is redirecting the focus toward sustainable and reliable energy sources, which in turn is influencing the market outlook. 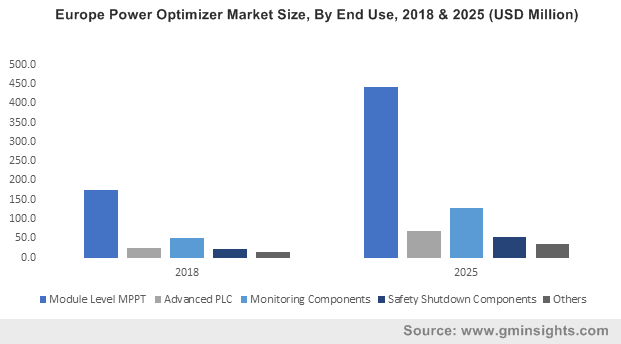 Driven by the handsome number of government solar projects that are continuously being launched, thin film solar cells market share from utility sector is slated to exceed a power capacity of 60 GW over the coming seven years. US is one of the prominent regions which is actively involved in the market. 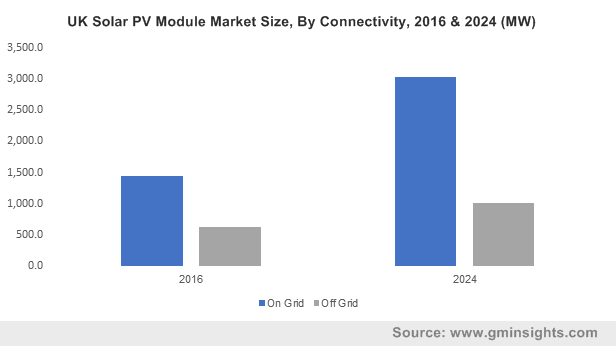 Positive outlook toward relying more on renewable energy sources along with increasing installation of photo voltaic models is fueling U.S. thin film solar cells industry. Asia Pacific is expected to hold a considerable industry share in terms of revenue with China prominently driving the regional demand. China thin film solar cells industry accounted for more than 40% of the regional market in 2015 and will register a massive double digit growth rate of 15% over the forecast span. The growth can be attributed to the huge investment in the PV projects in China. UK thin film solar cells market covered more than 25% of the market share in 2015 and will cross 4GW power generation capacity by 2024, owing to the favorable government initiatives pertaining to sustainable energy production. Market players are concentrating more on research activities to enhance the product quality along with improving the energy efficiency. However, lack of proper knowhow of the ongoing financial incentives related to non-conventional energy sources may act as a deterrent in the growth path of the industry. Prominent participants of thin film solar cells market include Hankey Asia Ltd., Ascent Technologies Inc., Hankey Asia Ltd., Global Solar, Inc., and First Solar. This entry was posted in Sustainable & Smart Technologies and tagged A-Si, Amorphous Silicon, Cadmium Telluride, CDTE, Copper Indium Gallium Diselenide, Off Grid, On Grid, Thin Film Photovoltaic Cells Market, Thin Film PV Cells Market, Thin Film Solar Cell Market Trends, Thin Film Solar Cells Market, Thin Film Solar Cells Market Size, Thin-film Solar Cell.